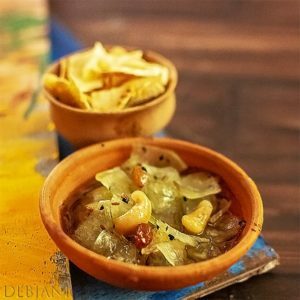 Kumror Chakka, the recipe and a mother’s wish for her daughter’s Biyer bhoj! “Dolon the gala spread on the day of your marriage must include Kumror Chakka, Dantiwala Begun Bhaja, and Luchi along with at least 6-7 fish items. I want to set up “Vien” for the sweets as well!” My mother used to say this whenever there was a discussion on my marriage years back. I have seen her planning for my marriage. I have seen her planning for every single thing; how big the programme should be or what would be part of the menu or exactly how she wanted to see me as a bride. However, at that time I used to oppose her strongly, like an adamant teenager; “Why Kumro Maa! Nobody likes pumpkin and I don’t want Dantwala Begun bhaja (fried aubergine) as well. We must include meat!” She then started describing a typical “bonedi barir Biye” of 50s and 60s and the glamor of the same! However, I never liked the idea at that time and used to tell her mine will be a simple marriage mom! Call it destiny or call it irony, this is what happened! There was no marriage invitation, no jewelry, no Red Benarasi saree or the traditional bhoj on my marriage. It actually was a simple celebration of court marriage. This probably is the only wish of my mother I failed to accomplish; knowingly or unknowingly. She wanted her daughter to opt for quality education; I tried to achieve that and I tried my best. She wanted her daughter to earn her own bread and butter, She used to say “I don’t want your money but I want to see my daughter’s pay package is on the higher side compared to the male child of the family”. I don’t know how much successful I am but I earn my bread and butter for sure. 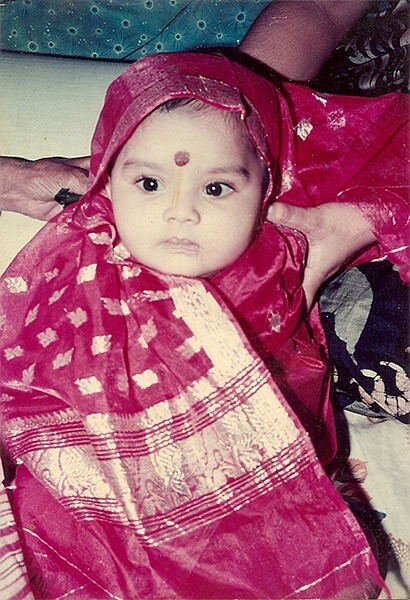 The bride to be years back! She wanted me to be a strong Woman and that I think the wisest thing she wanted for me! To achieve that, I failed to have that dream marriage programme she wanted for me. I am married and to be very frank I am married to the person I thought is best for me. Don’t think that she is strict or has lots of demand! No, she is not that! She always wanted the best for me but never ever pressurized. However, we did opt for simple court marriage instead of the glittery programme. We thought that was wise at that moment when both the families were in shock to accept that there will be a Hindu Muslim Marriage with no interference of Religion. After 7 years when I found the families happy with our decision; I also realize how much they love us. However, there is no shame to accept that 7 years has made me (us) matured too and a mother (parents) as well. Now that, I at times think about how I want to see Pasta as a bride, I realize what my mother or mother in laws dream must have been. Believe me, I (in fact both of us) know we actually as children didn’t give them a few things they as mothers desired for. A basic thing, in fact, to see the offspring married just like they want. I know the post is getting lengthy and I have to now move on to the recipe but these are the things I must mention. I remember those wishes by my mother every time I cook the simplest delicacy, Kumror Chakka at home. Kumror Chakka is a popular one amongst the Bengali vegetarian dishes. In fact, back in 50s, the 60s and even in 70s it was part of the typical Bengali Marriage menu. 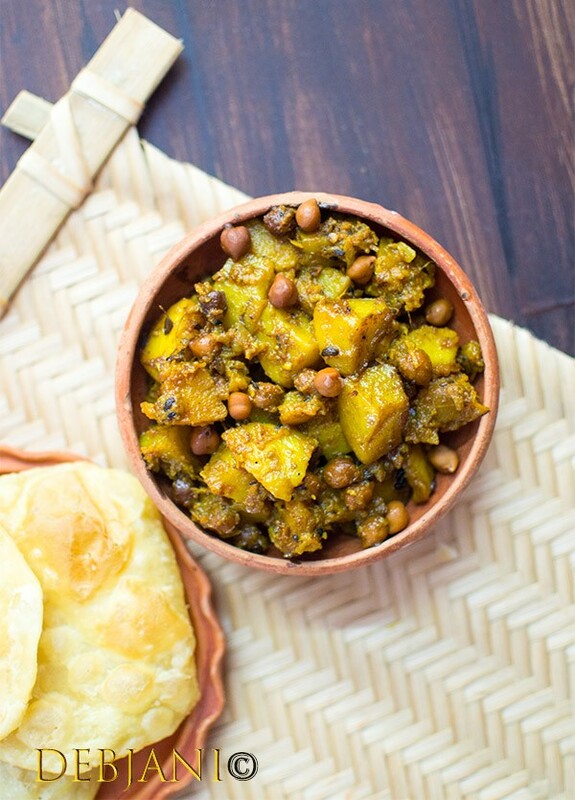 Chunks of Pumpkin and Potatoes tempered with Panch Phoron and cooked in Ghee Kumror Chakka is bliss and goes amazingly with Luchi. In fact, I love it with Roti as well. The recipe I follow is a family heirloom one came from Thakuma to Jethima and now I and my sister in laws follow the same. A no onion no garlic recipe, in fact, some in the family used to say nobody can beat Mammam (Jethima) when it comes to Kumror Chakka. This simple recipe is dedicated to the women of my life; who matters; a lot to me! Kumror Chakka, a Bengali no onion no garlic side prepared with Pumpkin/ Kaddu and Potato. Panch Phoron/ Bengali Five Spices: 1 Tsp. 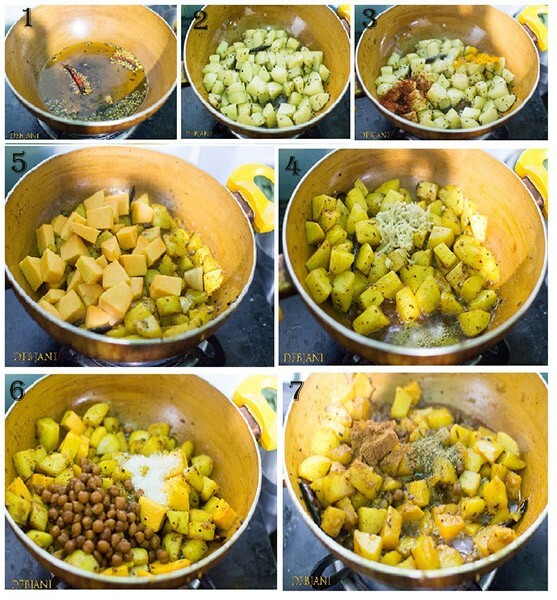 Soak Whole Bengal Gram / Kala Chana/ Chola overnight in water. Discard the water and boil Chola with ½ Tsp Salt in a pressure cooker on low flame with the whistle on until 3 whistles come. Open the lid when the pressure drops and discard the water. Peel and cut Pumpkin and Potatoes into 1" cubes (as shown in the picture). Make corse powder of ½ tsp. Panch Phoron. Now heat the oil in a deep bottom pan and temper it with ½ Tsp. whole Panch Phoron, Red Chili, and Bay Leaf. Add Potatoes and ginger paste and fry on low flame until potatoes soften. It will take around 5 minutes. Now add pumpkin chunks and mix. Add Turmeric Powder, Red Chili Powder, and Salt and mix. Now add boiled chickpeas and cover the pan with a lid and cook on low flame for around 10 minutes. Cook till the veggies soften but the shape remains same. Add Sugar and Stir in between. Once done, add ghee and Bengali Garam Masala Powder and Panch Phoron Powder and give Kumror Chakka a generous mix. 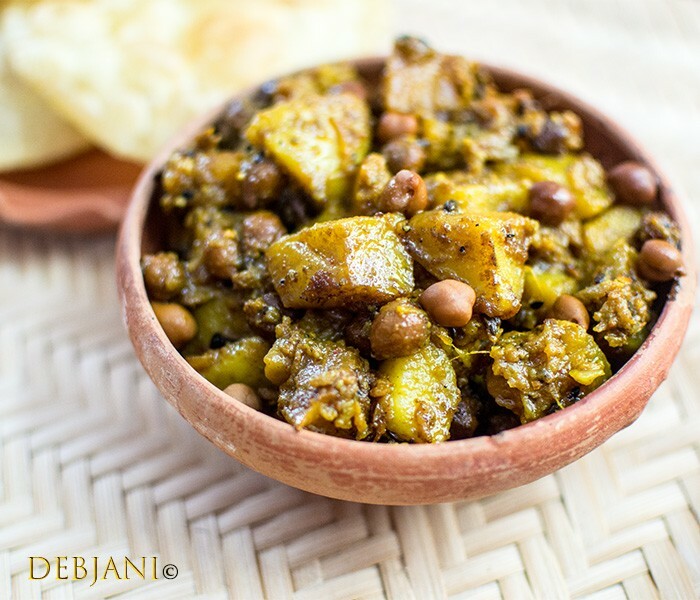 Do try the Narkel diye Niramish Ghugni or Katoya Data Chorchori or Kumro Phuler Bora. 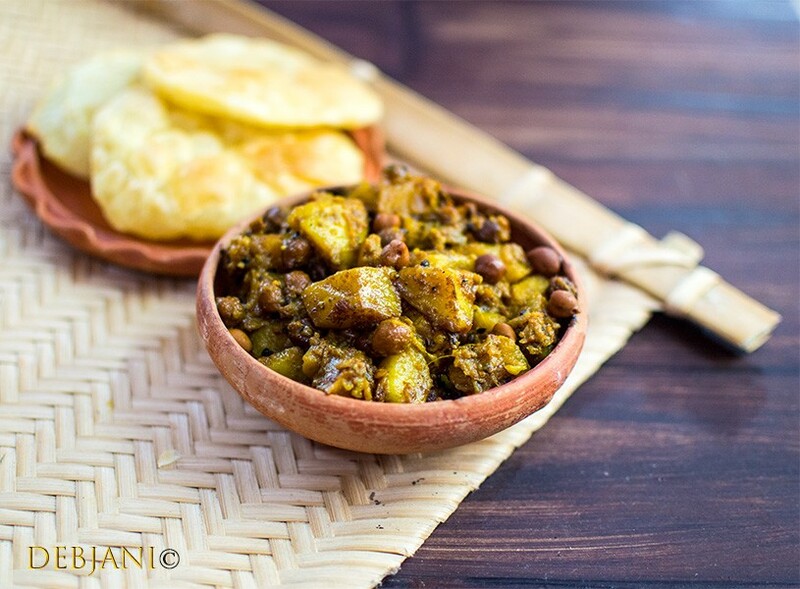 Have you tried the Kumror Chakka Recipe from Debjanir Rannaghar!